It’s hard to picture, given how developed and busy the area is now, but 45 years ago, the land on which the Bakerview Rd Fred Meyer is located was Bellingham’s only public-access golf course. When it was shut down in the late 1960s, demand remained for another golf course, and a heavily-wooded site between Lake Padden and Galbraith Mountain at the opposite end of the city was chosen. Lake Padden had been a reservoir and the city’s main source of drinking water, but as the population grew the supply of water from the lake and its relatively small catchment area had become insufficient for the increasingly thirsty city, so Lake Whatcom took over. It was agreed that the area surrounding Lake Padden could not be developed unless the people voted for it, so a 900-acre municipal park was established. Just less than a quarter of it was set aside for the new golf course. Lake Padden opened in 1971, and fifteen years later benefitted from numerous capital improvements completed under the supervision of Parks Operations Manager John Ivary, and Byron Elmendorf who replaced Olson as Parks and Recreation Director. New tees were built, bunkers were renovated and Goss’ intricate drainage system was upgraded further. The improvements are still very much in effect nearly 20 years later, as the course remains playable right through the invariably wet winters, closing only for severe frosts. Lake Padden has earned a four-star rating from Golf Digest and hosted the 1995 Pacific Northwest Golf Association (PNGA) Public Links Championship and 2003 Washington Senior Open. It is home to the Lake Padden Golf School, a hi-tech golf-training facility that uses the Trackman Launch Monitor to analyze students’ performance and which focuses on junior golfers in particular. It is managed by Director of Instruction Luke Bennett. A bucket of balls on the range before you head out on to the course is highly recommended anywhere you play, but it’s crucial at Lake Padden as the course opens with a 424-yard uphill Par 4 that justifies its status as the #1 handicap hole. The similarly tough 421-yard 10th, which runs parallel to the 1st, is the #2 handicap hole presumably because it’s three yards shorter. Long hitters should lap up the four Par 5s, none of which exceeds 530 yards. But for the average golfer, your average Par 5 gives too much opportunity for bad shots and big numbers, especially when they’re lined by mature trees. The most user-friendly hole for the 18-handicapper is probably the 140-yard Par 3 12th. There are no lakes, ponds, creeks or ditches, and the bunkers left and right are not terribly deep or menacing. The green is tilted some from back to front, but it’s large and there’s nothing in front of it, so even a miss-hit might result in a birdie putt. 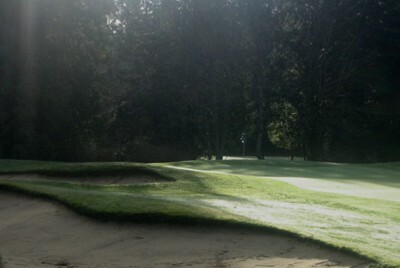 Players will look to get up in two at all four of Padden’s Par 5s. The 5th is the longest at 530 yards and curves gently from right to left, meaning a draw is more or less essential off the tee if you are to get into position to attack the green. The 521-yard 7th moves uphill slightly, the 498-yard 11th, like the 5th, demands a significant right-to-left shot off the tee, and there’s a pond to the left of the fairway at the 519-yard 13th. So, while they’re all accessible in two, you still need a couple of carefully planned, well-struck shots to get home. The Par 4 at which most people are going to get close to the green is the excellent 329-yard 14th. It's uphill all the way, so you probably won’t actually reach the putting surface, but after a decent drive, you should be left with nothing more than a sand wedge. The 8th is 23 yards longer but heads downhill, so some might get close here too. The 15th is one of Padden’s best holes – a downhill left to right dogleg that requires a significant fade off the tee to set up a mid/short-iron to the green. Rough, sand and even water lie in wait for drives lacking sufficient fade-spin and trees on the right catch those that overdo it. A great hole where a Par 4 usually beats your opponent. 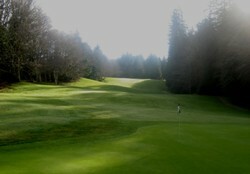 The vast majority of Lake Padden’s 18 holes are surrounded on all, or most, sides by tall firs, so it could be argued the wayward golfer should think twice before taking the driver out at all. Those trees make the fairways appear a good deal narrower than they really are, however; the short grass is actually plenty wide enough to accommodate a cultured fade or draw. Just don’t be hooking, slicing, pulling or pushing it. If you prefer to focus on keeping your ball in play rather than squeezing every last inch out of your drives, then there’s really no reason why you would hit the driver at virtually every two and three-shot hole. With all those unforgiving firs about you, the trick at Lake Padden is to content yourself with having a shot into the green, no matter how long it is. The golfer who pounds away all day with little thought as to placement is going to run up a score he will not want advertized. The downhill 8th, which starts in the trees but opens up a little further down the hole, is one of the very few places where you might get away with a long but errant tee shot. But remember; what happens on the 8th, stays on the 8th. 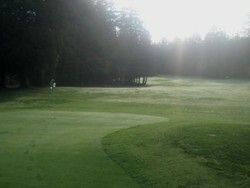 Bellingham golfers know how fortunate they are to have a course like Lake Padden to call home. The fact that 50,000 rounds are played here every year will not surprise the first-timer once he sees how great a value the $32.20 green fee is. What will surprise him is the condition of the course, and the greens in particular, which have no right being this good considering the amount of traffic they endure. Mark Challender, a member of the Lake Padden Men's Club Board of Directors suggests average recreational golfers play from the Rust tees (5,727 yards) 'because of the course's difficulty'.